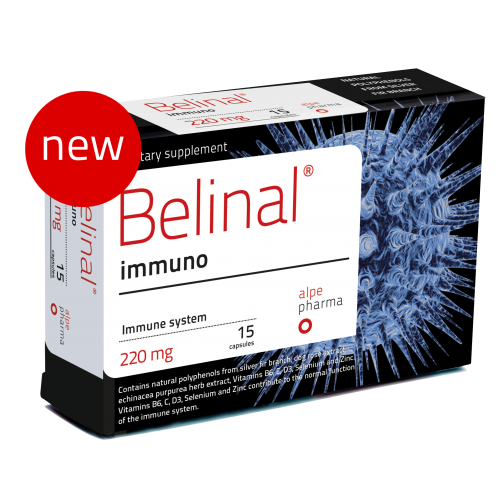 Belinal® immuno is a dietary supplement developed on the basis of scientific research in Slovenia. A unique mixture of ingredients, which work together to strengthen the immune system. It contains a patented extract of silver fir branches - Belinal® Extract, echinacea extract, rose hip and vitamins B6, D3, E and minerals zinc and selenium. Vitamin C, B6, D3, and E have a role in strengthening the immune system. The essential minerals selenium and zinc are important for the proper functioning of the immune system. Dietary supplement containing 100% natural, patented extract from the Slovenian Silver Fir - Belinal® immuno, is a new formula of three natural extracts, three vitamins and two essential minerals. It has been developed on the basis of research carried out on the impact of extracts from the silver fir, on the immune system. • When having a weakened immune system. Belinal® the Slovenian patented extract from the branches of the silver fir, which has Cosmos certified natural active ingredients. Belinal® is obtained from specific parts of the branches, which are hand harvested in the ecologically pristine mountain forests of Slovenia, exclusively from regularly scheduled harvest. Scientists have discovered in these areas of the branches of the silver fir tree, an extremely diverse composition of 36 different polyphenols. Which are distinguished by their antioxidant and immunomodulatory properties. In recent years the effect of the extract from the branches of the Silver Fir have been described and published in several scientific articles and reputable scientific journals. A medicinal plant which originates from North America, has played an important role in folk medicine for many Indian tribes. Echinacea prevents and treats colds and strengthens the immune system. It also shortens and alleviates the duration of symptoms of the common cold and influenza. It has been proven to contain antibacterial and anti-virus properties. It is most effective when taken at the first signs of infection or illness. For the best results it is recommended to take for at least seven days. Rose hip is the richest natural sources of vitamin C, which is contained in the fleshy wrapping of the fruit. The most vitamin rich fruits, are those which have not yet softened or have not lost a bright red color. The seeds also contain Vitamin E and Vanillin. The crushed seeds also give off an aromatically pleasant scent. In addition the rose hip contains vitamins A, B1, B2, E, K, and bioflavinoidi linolenic acid. Vitamin C plays an important role in the functioning of the immune system and contributes to the reduction of fatigue. Vitamin B6 also known as pyridoxine. Vitamin B6 is water soluble. In the body, Vitamin B6 participates in more than one hundred reactions, and plays a central function in the metabolism of amino acids and regulation of hormones. Vitamin B6 also plays an important role in the function of the immune system. Vitamin D3 is a fat-soluble vitamin that is synthesised under the skin when it is exposed to the sun. Vitamin D3 is useful in many areas of health, also contributes to normal absorption and use of calcium and phosphorus and contributes to the normal function of the immune system. Vitamin E is one of the most effective antioxidants in the human body, its most important function belongs protect biological membranes against the harmful effects of radicals. Studies show that Vitamin E also works on a number of components of the immune system. Zinc is essential for the activation of many genes, and as a cofactor in various enzyme reactions. It is a component and an activator of many enzymes in the metabolism of proteins, carbohydrates, fats, and hormones, and also participates in the storage of insulin. Selenium in the body participates as a cofactor to vital enzymes and protein and antioxidant mechanisms. Selenium is also important in regulating cell growth and maintenance of fertility. Selenoproteini have antioxidant properties. It was also found that the selenium in protecting the body fat oxidation synergistic effect with tocopherols, or vitamin E.
Zinc and Selenium have a role in the functioning of the immune system and contribute to reduce fatigue. Colds are caused by many viruses that are transmitted by direct contact with an infected person. The Cold is a mild inflammation of upper respiratory tract. This illness and its symptoms can lasts up to 7 days. Adults have an average of two to three colds a year and children, between six and eight colds per year. When recovering from a colds many people do not stay home, but continue their normal schedule, thereby inadvertently exposing and infecting their fellow employees, family members and others around them. Characteristics of a cold are nasal congestion, sneezing and sore throat, which may be accompanied by a mild cough. Influenza caused by influenza type A, B or C and is an acute viral disease of the respiratory tract. Symptoms can last from one day to two weeks. As a rule, the flu disables a person to bed for 2 or more days. Some examples. In a prevelant flu complications can be more severe than the common cold, as it can develop into sinusitis or pneumonia. Typical influenza symptoms as fever, muscle pain and fatigue in the early stages of the disease. These symptoms are often accompanied by a pronounced cough. Belinal® immuno is a dietary supplement. The patented extract of white fir branches Belinal® combined with echinacea extract and rose hip extract, vitamins C, B6, D3 and E and the minerals selenium and zinc for immediate immune system support. Echinacea aids the immunostimulatory and immunomodulatory activity in the immune system, it is distinguished by an antiviral and antibacterial properties.Echinacea is a well documented and is one of the most researched herbs. Rosehip is the richest source of natural vitamin C, and also contains vitamins and bioflavonoids. An important contribution to the reduction of tiredness and fatigue and improves well-being. The polyphenols in the extract from the branches of the silver fir, is characterised by its antioxidant properties and has a favorable effect on the acquired immune system. Vitamin E protects cell membranes from oxidative stress and free radical damage. It is recommended to take one capsule every 6 hours, with water. and up to 3 capsules daily. Dosage should be continued for up to 10 days. - With all the serious disorders of the upper airways. In the case of a strong cold or flu is also important to get adequate rest and drink plenty of fluids. When experiencing a severe fever or pain take medicines for reducing the fever recommended by your doctor. Dietary supplements are not a substitute for a balanced and varied diet. The recommended daily take should not be exceeded. It is also recommended to lead an active a healthy lifestyle. As a dietary supplement containing the herb extract American pink coneflower is not recommended for use by children under 12 years of age, pregnant women and nursing mothers. Dietary supplement containing the patented extract of the silver fir branches Belinal®, herbal extract echinacea, rose hip extract and vitamins C, B6, D3, E, selenium and zinc. Belinal® extract branches silver fir ( Abies alba ), extract of the rose hip ( Rosa canina ), extract of herbs coneflower ( Echinacea purpurea herba ), bulking: microcrystalline cellulose, maltodextrin, zinc citrate, D-alpha tocopheryl acetate, an anti-caking agent: magnesium stearate and silicon dioxide, pyridoxine, selenomethionine, cholecalciferol. sweeteners, lactose, yeast extract, gluten, artificial colors, preservatives, and is suitable for vegetarians. Children under 12 years of age, pregnant women and nursing mothers must before using consult your doctor or pharmacist. Do not take for more than 10 days. If you are taking medicines to us by e-mail info@alpepharma.si know what medicines you are prescribed. Your doctor or pharmacist will be writing posts or restrictions exist. Dietary supplements are not a substitute for a balanced and varied diet. The recommended daily take should not be exceeded. It is recommended a healthy lifestyle. I would like to praise the Belinal® immuno product. After severe influenza and pneumonia, I was advised by pharmacist in the pharmacy store Melisa in Škofije for this product. I was extremely astonished with the results.